Getting married and haven’t zeroed down on a photographer who can capture moments in the most candid way possible? Sit back and relax. We have a list of 6 Pune-based photographers who can do the job well and won’t charge a hefty amount. Read on! Founded by Abhay Lohokare, Pune Dusk specialises in candid photography and cinematography for weddings. An alumnus of Vancouver Film School in Canada, Abhay believes in delivering quality photographs that look simple and unscripted sans over-the-top romance and cheesiness. For more details, check out his work here. A popular choice in Pune, Sarang has a knack for teeny tiny details and brings out the unfiltered, candid chemistry between two people. Check out his work here. 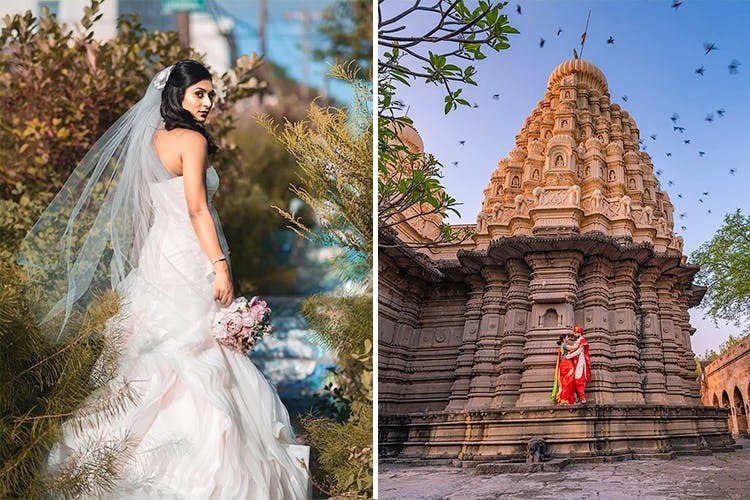 From pre-wedding shoots to candid videography, Weddings By Highroad is a team of creative photographers based out of My World in Baner-Balewadi Road. The best thing about them is their attention to details and producing a series of photo ops that look natural and happy. Check out their portfolio here. Bhushan is a fine art wedding photographer based out of Pune. The one thing that we absolutely loved about his portfolio was the drama that he brings out in his photos through colours, emotions and gorgeous backdrops. Check out his work here. VFX artist turned wedding photographer, Ishan Wadke is based out of Shivtirthanagar in Paud Road, Kothrud. He blends in contemporary ideas with traditional techniques with ease and captures nothing but the best moments for you and your loved one. Check out his portfolio here.